Our product range includes a wide range of rotary mono block weigh metric fillers, rotary filling machine and rotary monoblock level fillers. Rotary Mono Block Weigh Metric Fillers offered feature support of directly integrated drive and do not require belts and chassis support for meeting operation requirements. Further, these fillers allow for convenient tool-less changeover and have covers and shirting labyrinth design for avoiding leakage. 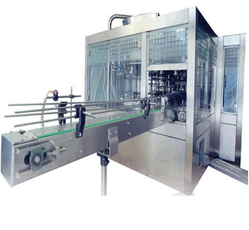 Some of its features include modular design finish; available in different functional capacities of 500gms to 5kg; smooth drains and lifetime lubricated bearing support; advanced PLC controls; plug and play load cell modules; motorized up and down movement of the tank along with nozzles among others. PLC controlled large size touch screen on the operator panel. Model Different models for filling from 500 ml to 5 lit. 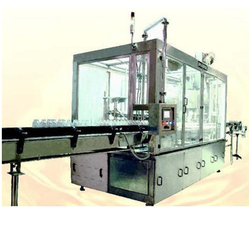 We are leading manufacturer and exporter of Rotary Monoblock Level Fillers. 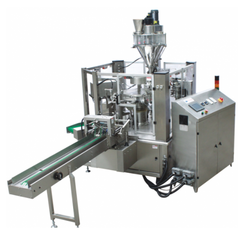 Looking for Rotary Filling Machine ?